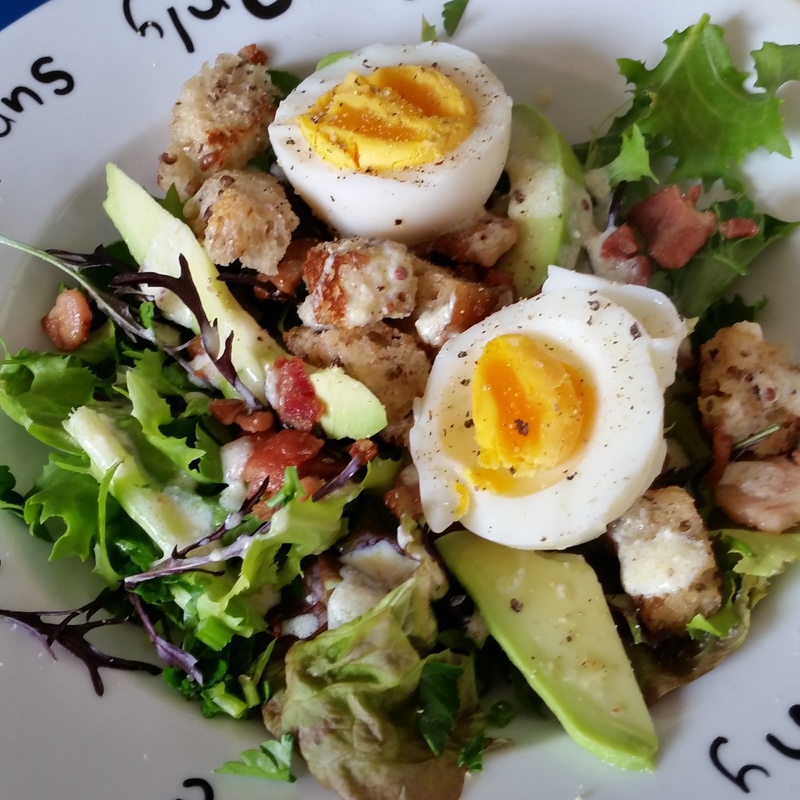 Note: Jeannie's Kitchen now being published on Jeannieskitchen.me. It's a hard job finding a perfect bran muffin, but my friends loved the ones I made recently for brunch and have put in a request for the recipe. When placing bran muffins in baking history it's natural to think of them arriving with the whole food revolution in the 1970's because of their high fibre content. But the earliest recipe comes from an 1857 cook book published in Philadelphia, and was raised by yeast like the English muffin. In the 1920's Fannie Farmer of the Boston Cooking School introduced them as a quick bread option using baking soda as the rising agent. In the late 1930's baking powder was added to make them even lighter as we prefer them today. Its name is thought to be derived from the low German muffen meaning "small cakes", but was first printed as Moofin...I kind of like Moofin. These bran muffins have blackcurrants added. Some of you may remember Manual Training while at primary school. The boys did woodwork and the girls cooking. 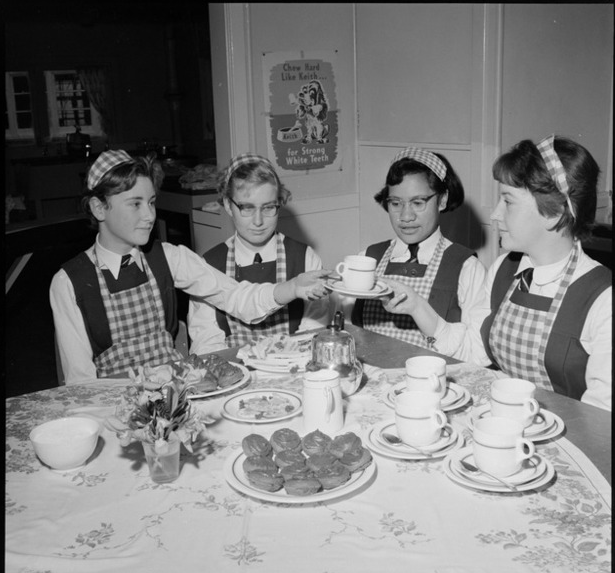 I'm sure my sister Kerry would have preferred woodwork to cooking and some of the boys on the bus wished they could be taking home edible rewards for their work, but it was the 1960's so there was no choice in the matter. I remember the small basket I would take containing an enamel pie dish, and a crisp white apron and headgear sewn by my Mum (to the required pattern). It was here I was introduced to bran muffins and the family got to try plenty of them as I perfected my baking skills. 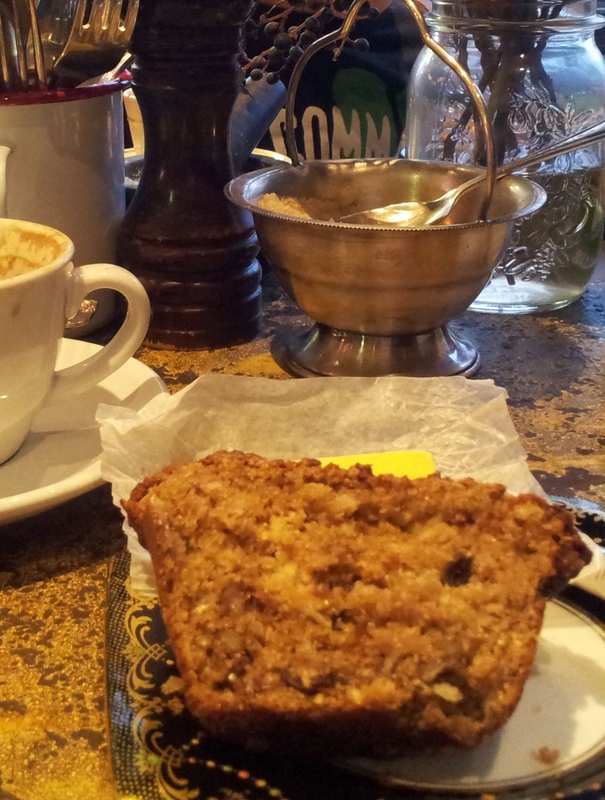 I've been reacquainted with bran muffins at one of our cafes here in Auckland, the Foxtrot Parlour in Ponsonby Central. 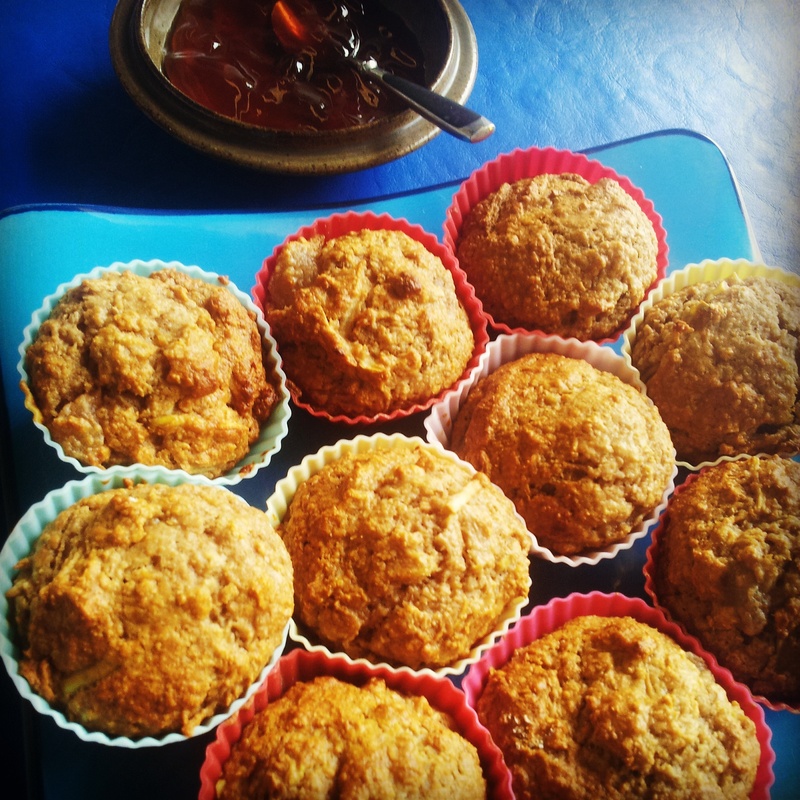 They do the best bran muffins and I have tried to recreate them using the recipe I discovered in a NZ Gardener publication. I have altered the recipe a little but recognise that Nana from Rangiora has given me a fine base recipe so I've kept true to the original recipe name. Delicious Bran Muffins at Foxtrot Cafe in Ponsonby Central - you have to be in quick because they usually are gone by 10. Handful of preferred dried fruit. 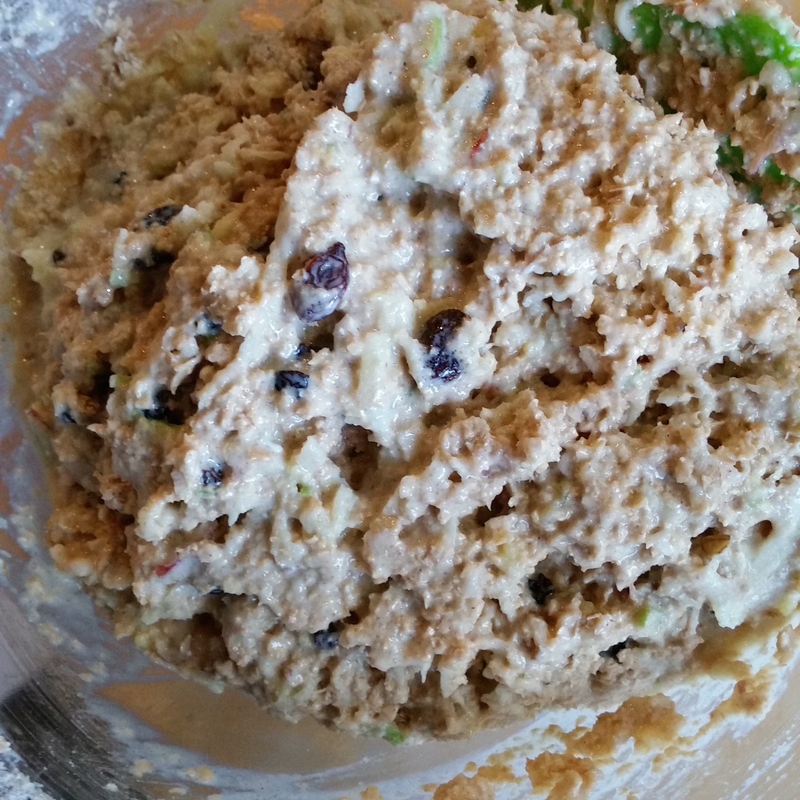 I use raisins mostly but have used chopped up dates, currants or cranberries. As many chopped walnuts as you can spare - as little as 1/4 cup up to about a cup. A heaped tablespoon of golden syrup with butter but you can replace the butter with oil if preferred. 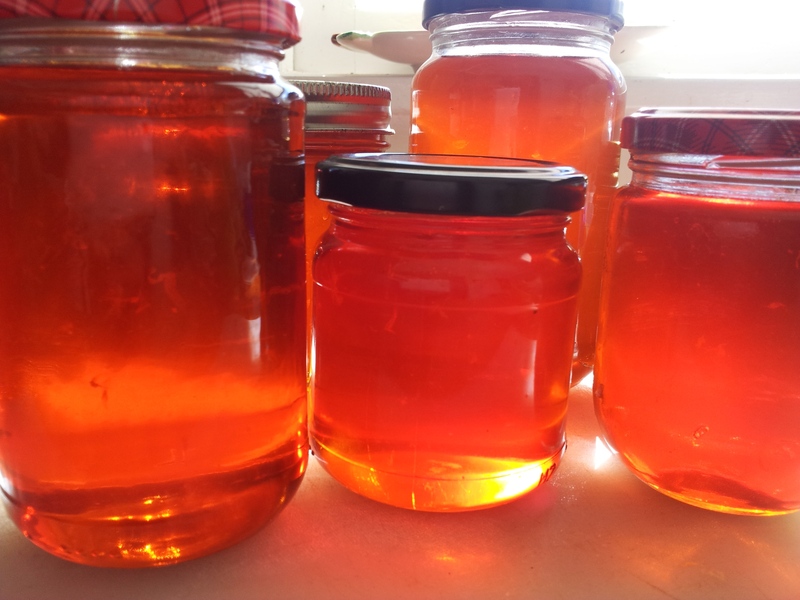 I have also used 50/50 golden syrup and treacle for a richer colour and flavour. 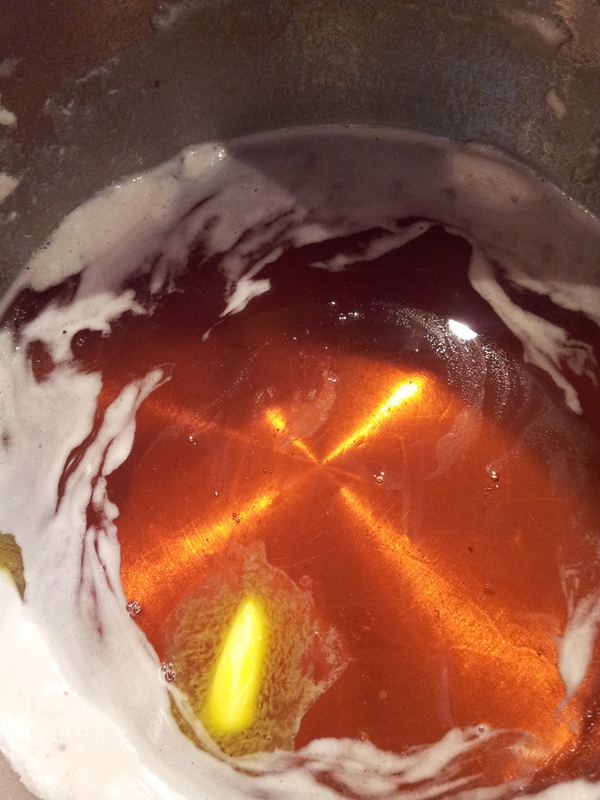 Mix golden syrup into melted butter to make a liquid. 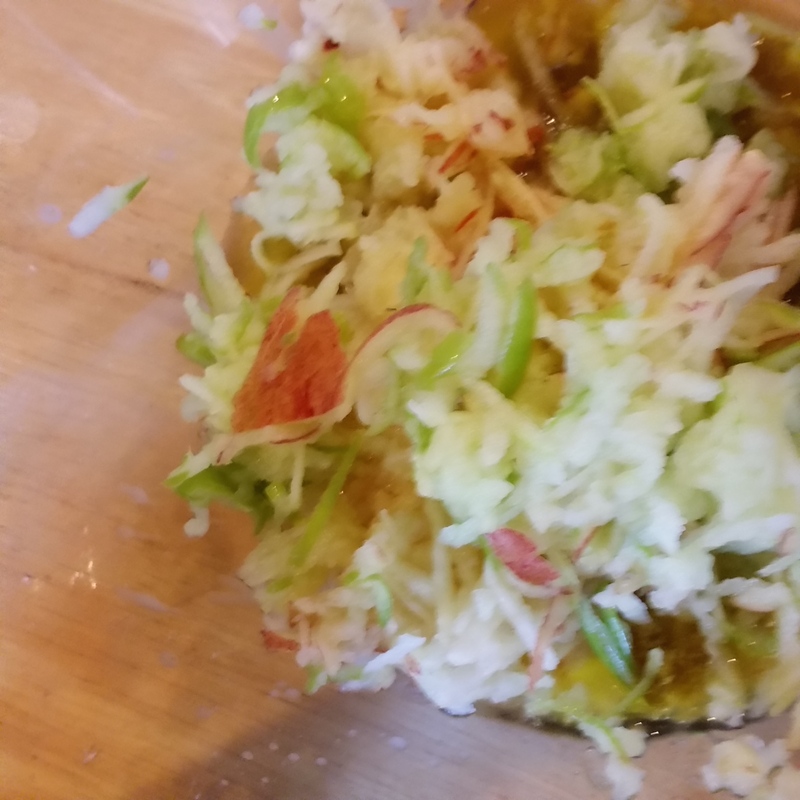 Add grated apple immediately to this mix to prevent it from discolouring. 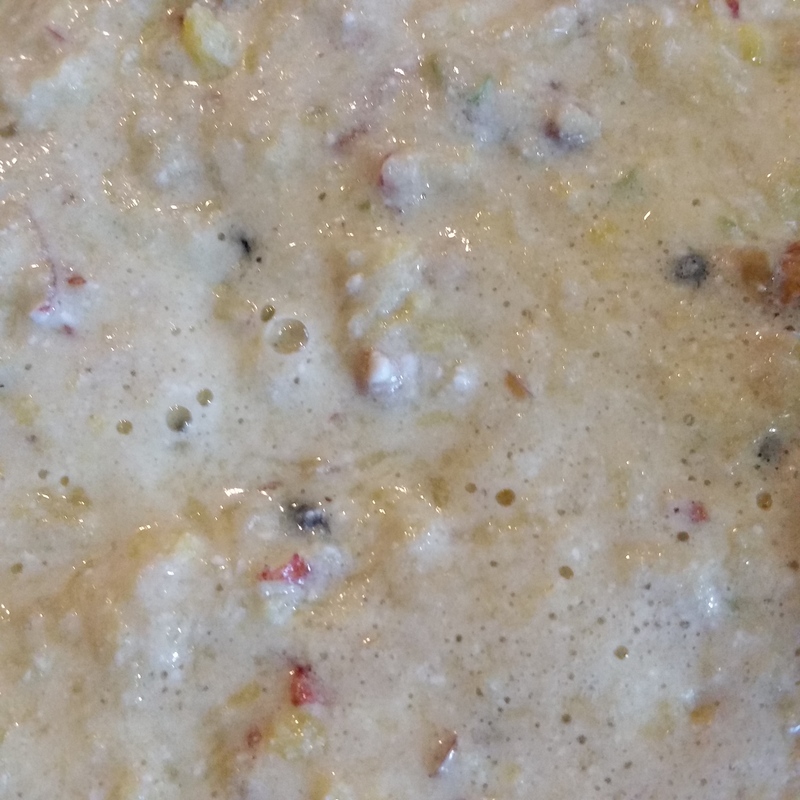 Next add in extra dried fruit and chopped nuts, the milk or kefir and beaten egg to this mix. A mix of red eating apple and a green Granny Smith apple. 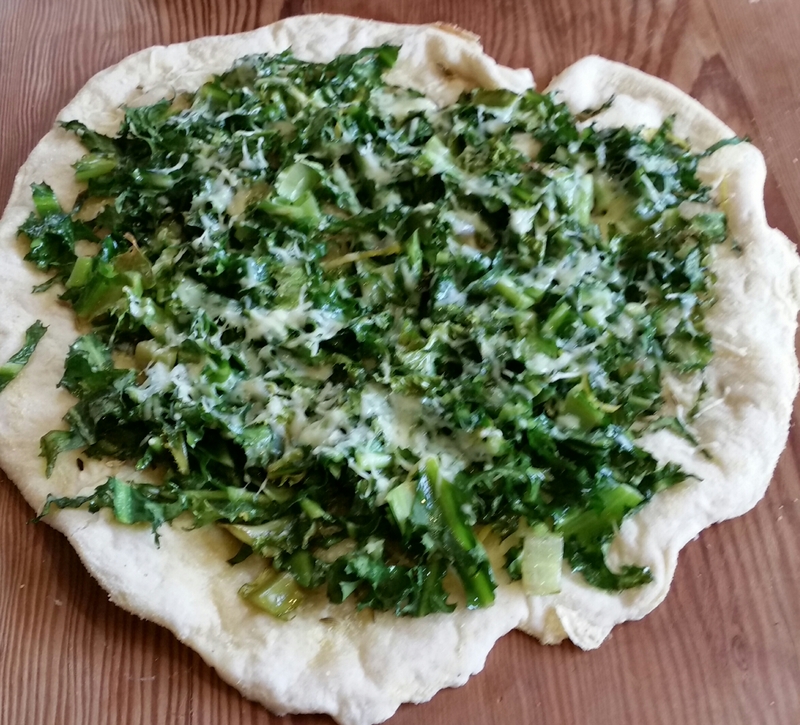 Put all the dry ingredients together except for the baking soda. Just before adding the dry and wet ingredients together, stir the baking soda into the liquid mix. You want the baking soda to start reacting but not to be completely spent. 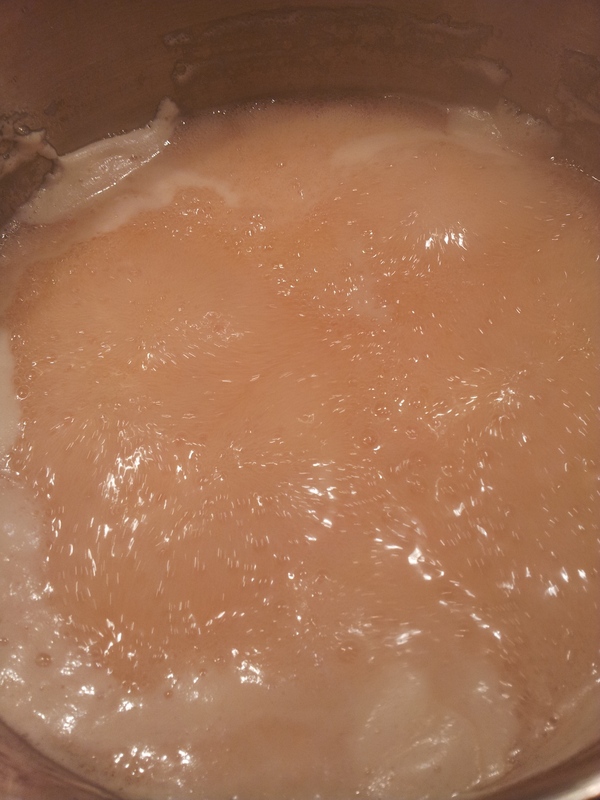 You can see the soda starting to bubble in the mix of golden syrup, kefir, egg and fruit. 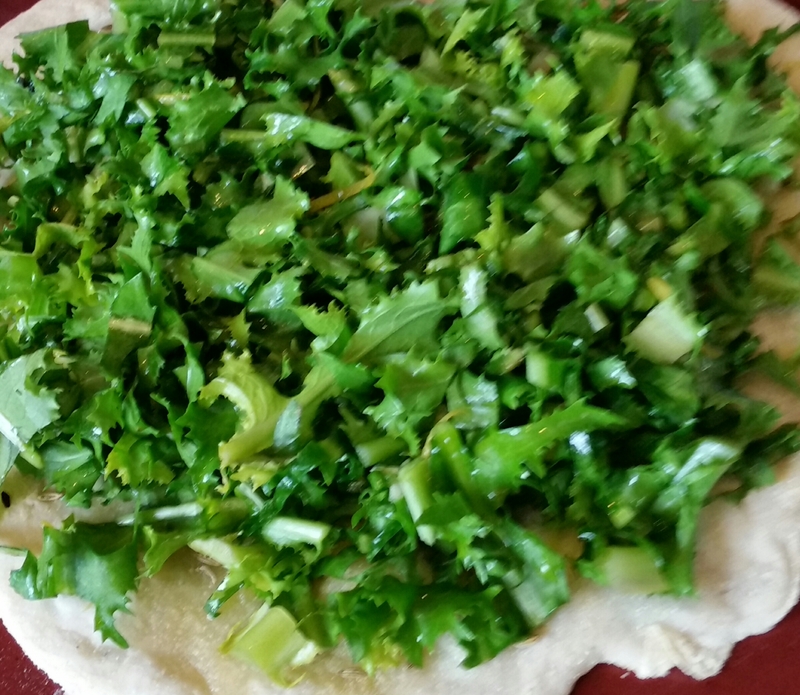 Now gently fold the dry ingredients into the bowl of wet ingredients. It's important with muffins not to over mix as this makes them tough. I find its easier to mix adding the dry mix to the wet mix. The mix should be moist and quite fluffy due to air pockets created in the mix by the baking soda. For those of you who are manufacturing your own kefir, I've found my muffins have improved since using it in the mix. They seem to be lighter and softer for some reason. 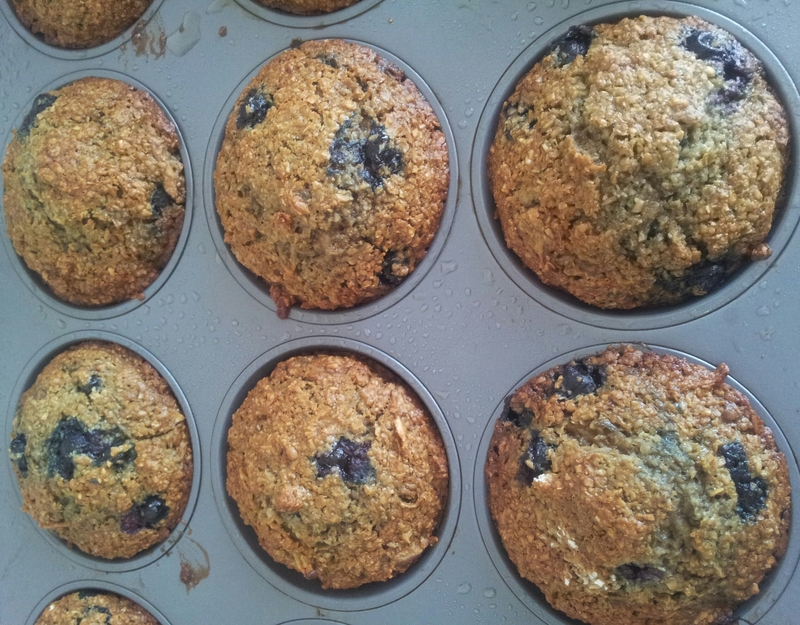 I spray or butter the muffin tins really well as the cooked muffins can be tricky to get out. 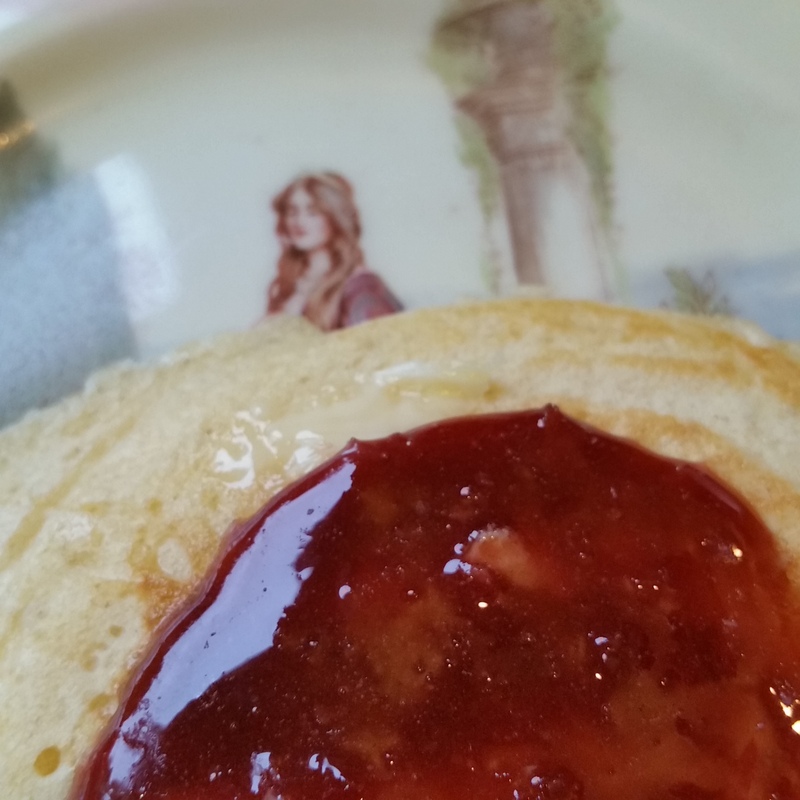 Using a dessertspoon I spoon the mix into the patty pans nearly to the top but allow room for them to rise. If the mix is very moist and the pans are filled too high they are likely to spread over the top of the muffin tins rather than rising up to a mound...making them difficult to get out of the pans in one piece. Alternatively you can use paper or silicon cases, but I prefer the metal patty pans. To add a little luxury I sometimes slice up some damson paste and pop into the top of the uncooked muffin mix so when you open up the muffin there is a little bit of softened jelly in the centre - yum. I have used quince paste the same way. 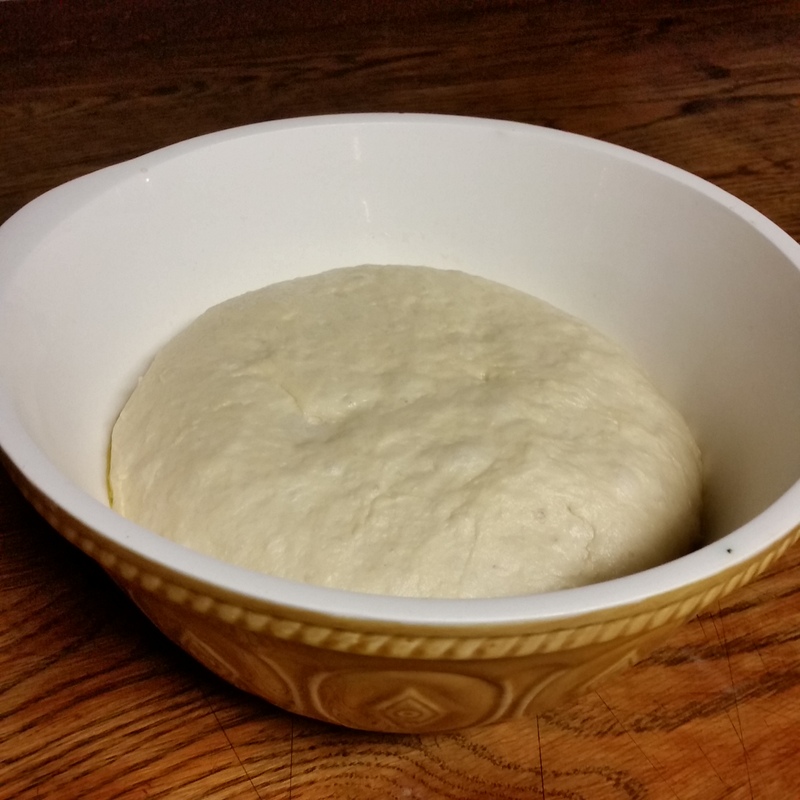 Bake for 12-15 minutes at 160C. Once cooked... leave to cool slightly, then run a knife around the edge of the muffin. Leave until cool enough to handle and then gently release them from the tins and put onto a wire rack to cool. Usually the family is lining up to eat them while still hot. They freeze well for future use. These muffins are moist so no butter is needed ...but butter is also nice. You can offer jelly or jam for those who like a sweeter taste but I prefer them as they are. 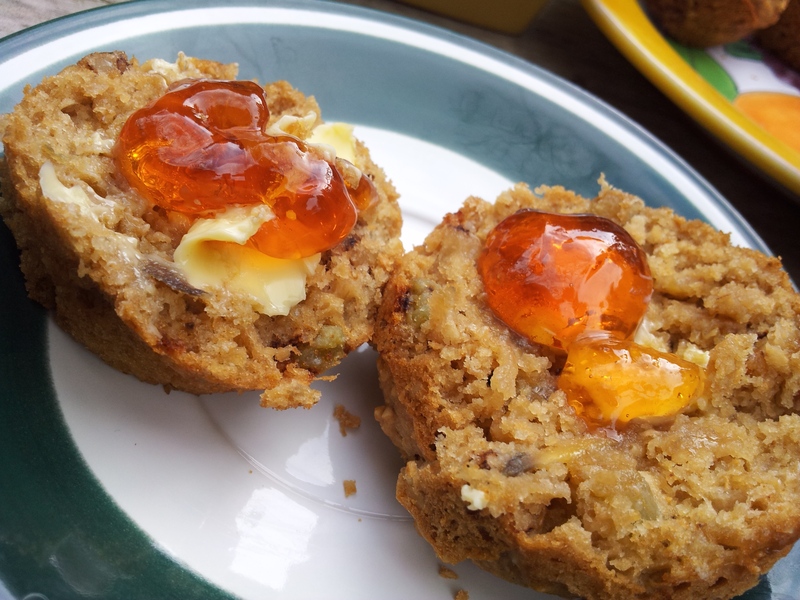 Nana's Bran Muffins with one of my jellies. You can replace the apple with any other fruit or vegetable but I really like the apple. I usually vary them by the added fruit or nuts. Instead of paste you could pop in a slice of crystallised ginger. If available I use fresh, frozen or dried blackcurrants or blueberries. I usually try to use oat bran rather than wheat bran because oat bran has more nutrients, but it's not so easy to find. 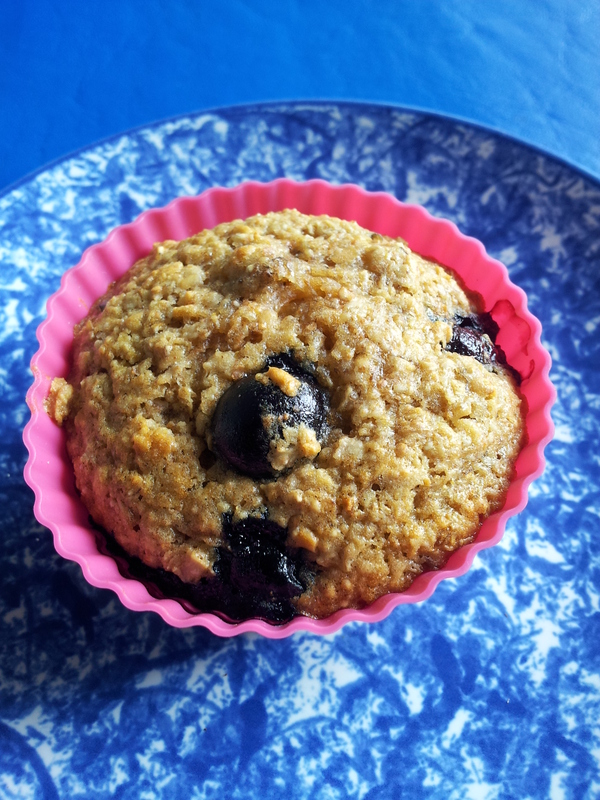 Oat bran makes a lighter coloured muffin and a nuttier flavour. Always buy bran in small quantities because it can go rancid very quickly. An idea is to keep it in the freezer if not using regularly. 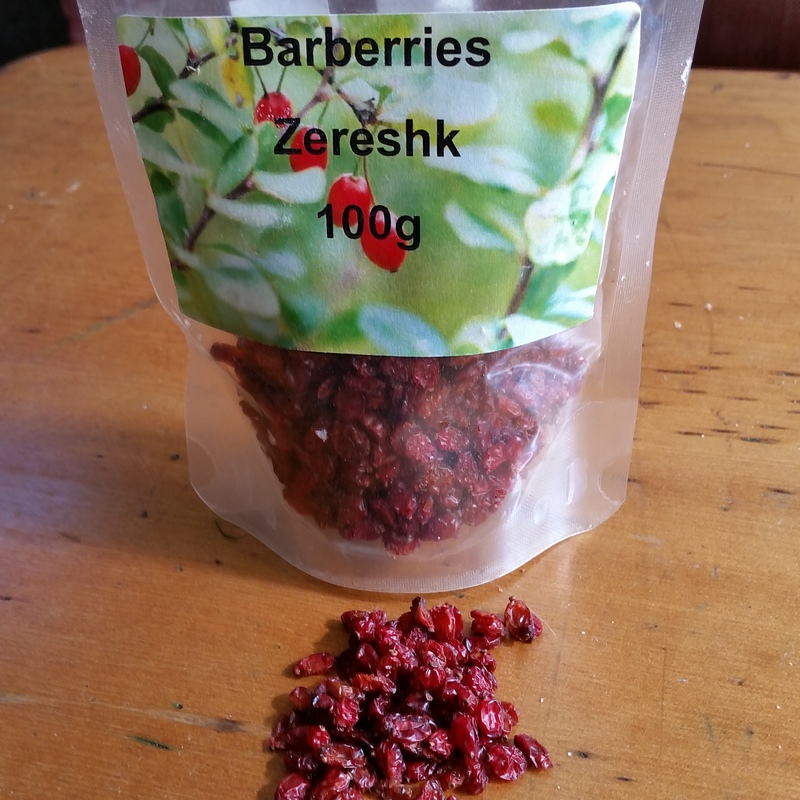 My latest find is dried Barberries which are the size of currants but have twice the zing and can be found in specialty stores. It's a product of Iran and could be under the name Zereshk. These little jewel like fruits were the something special I added to the muffins I served my friends at brunch. The muffin was born in the USA and are taken seriously enough to be considered as state symbols. The corn muffin is the official state muffin of Massachusetts, the blueberry muffin of Minnesota, the apple muffin of New York and New England claims the bran muffin. The New England bran muffins tend to include molasses where my recipe has golden syrup. Treacle or molasses would add a deeper flavour but be careful not to overdo the molasses and a good compliment to molasses or treacle would be ginger. I have always preferred the bran muffin to the cakey muffin that is offered in a lot of cafes. I believed bran muffins must be a healthy option with all that bran. But then I read Sally Fallon's "Nourishing Traditions". It's true bran as the outer coating of a grain contains most of the nutrients and fibre. 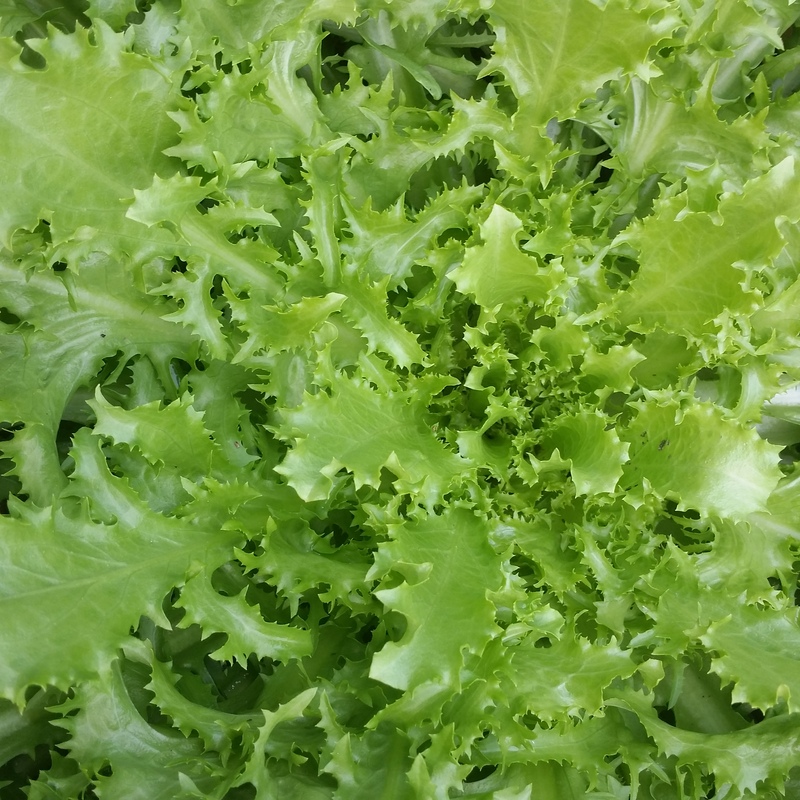 But it also contains phytic acid (an organic acid in which phosphorus is bound). 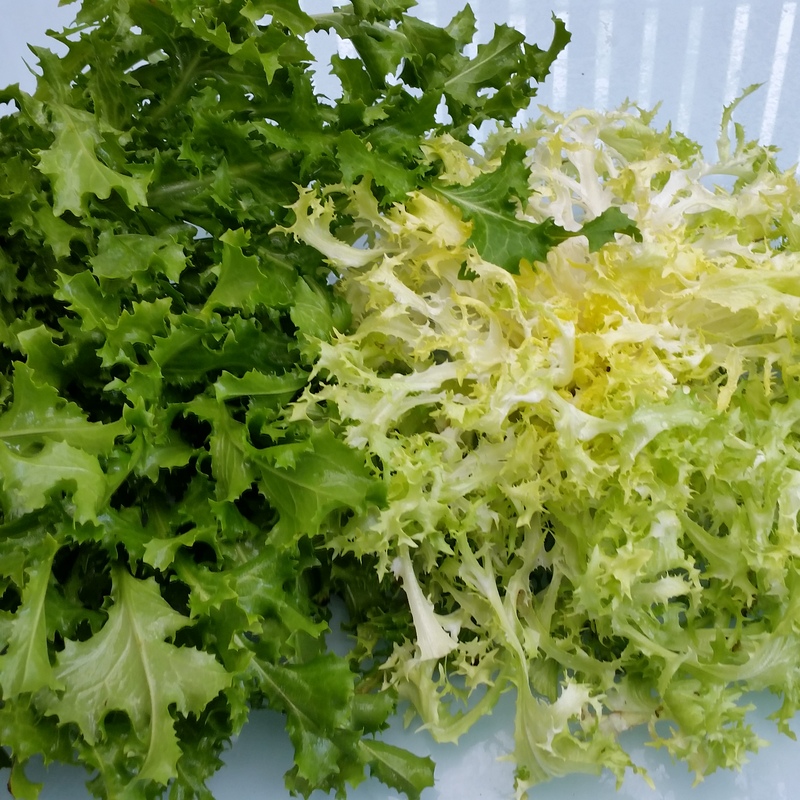 Untreated phytic acid can combine with calcium, magnesium, copper, iron and especially zinc in the intestinal tract and block their absorption which could lead to mineral deficiencies and bone loss. Ironically all that roughage could result in irritable bowel syndrome long term. Sounds terrible doesn't it? But this is unlikely to happen if you consume the odd bran muffin... you would need to be having a high bran diet and eating bran muffins every day. Most grains (including gluten free grains like Quinoa) have phytic acid and it's useful to know that this acid can be neutralised or treated by simply soaking the bran for 7 hours in warm water to break down the phytic acid before digesting the grain or bran. By adding a little whey, kefir or a squeeze of lemon juice will ensure an ideal environment for enzymes, lactobacilli and other helpful organisms to live in. Another benefit of soaking grains is that various vitamins will become available when we digest the grains that wouldn't have been otherwise. For an easy improvement to your porridge visit my post of September 2013 A Big Soak. I have attempted making these muffins by pre soaking the bran but they tend come out heavy. I will keep experimenting and if I'm successful in making a soaked bran muffin closer to what this recipe delivers I'll let you know. 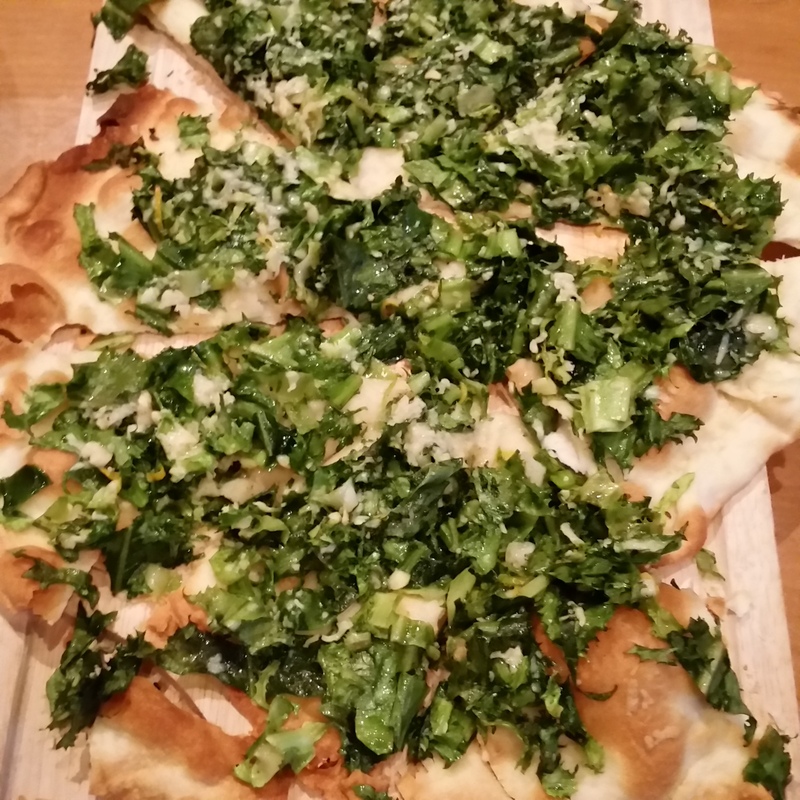 In the meantime, just as our family does, enjoy these delicious moofins every now and then. To forage is " to search widely for food or provisions" and a most delicious provision is a glossy jelly. I have miscalculated because this week I opened my last jar of jelly and now I'll have to wait until summer to restock. Until then, I can reflect on jellies past and future. What fruit or berry will I forage this summer/autumn? 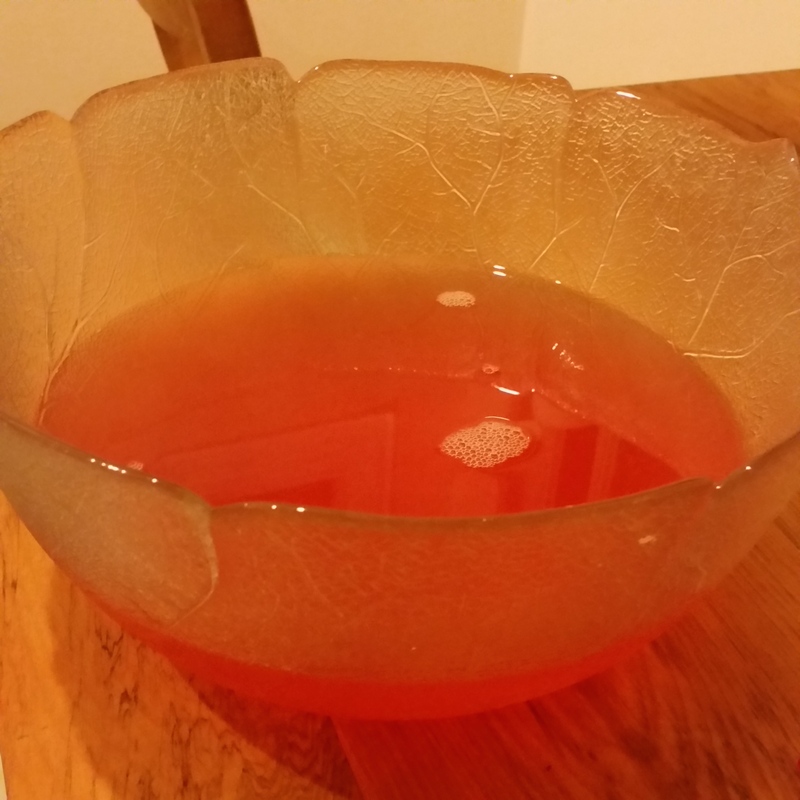 Tejocote Jelly (Mexican Hawthorne) Crataegus gracilior foraged from Christchurch Botanical Gardens 2014 - a jelly fruit that fruits midwinter. Making jelly is like any other skill, you just have to do it enough times to get good at it. But it also helps to understand the science of how a jelly sets. There are a few tricks I have learnt over the years and I continue to learn as I experiment each season. To make a few jars of jelly you need lots of fruit. Buying the ingredients is not economic, so to be a real jelly maker you have to learn to forage. 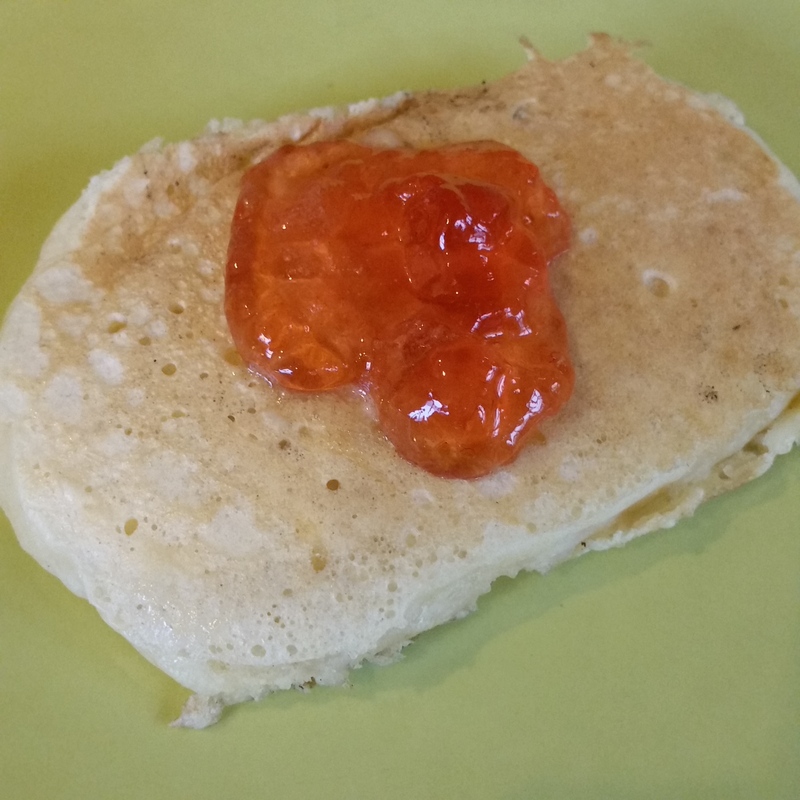 One of my favourites is crabapple jelly because of it its ruby translucence and it was the first jelly I ever made from foraged crabapples in the Dunedin Botanical Gardens in the 1980's. There is a lovely crabapple tree in our neighbourhood. Last October I photograph the tree in blossom, promising myself in autumn I would knock on the door and ask if I could harvest the crabapples. Tony, the tree's owner, was happy to give me permission to harvest on condition that I gave him a jar of the finished jelly and left some for the birds. I quickly agreed to the terms as I usually do both anyway. Crabapple Malus trees are worthwhile to have in your garden for the blossom alone. 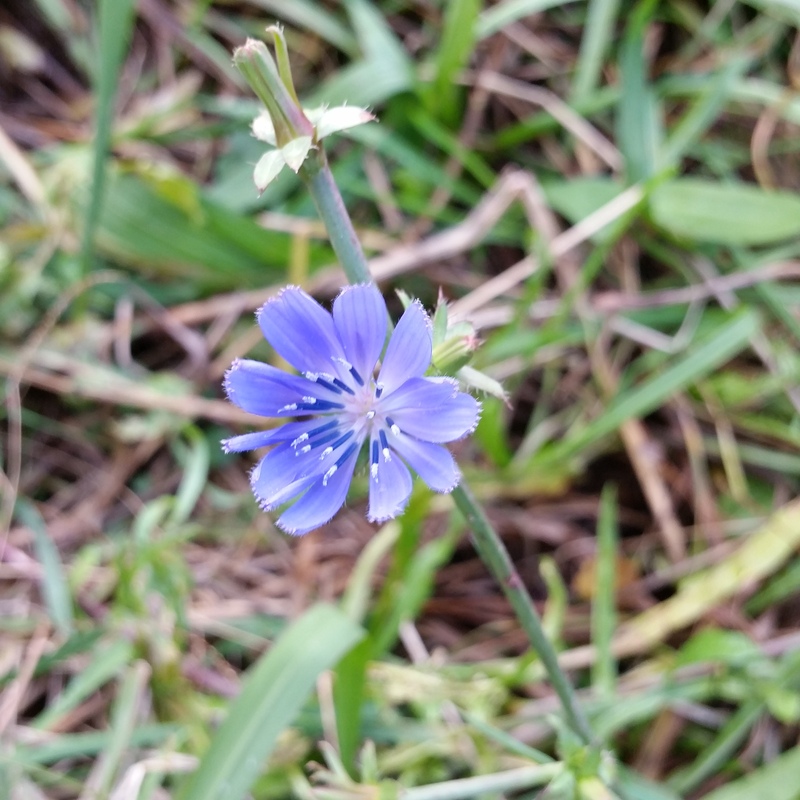 Some varieties flowers are white. First step is to wash the fruit a few times to get rid of any dirt or dust. 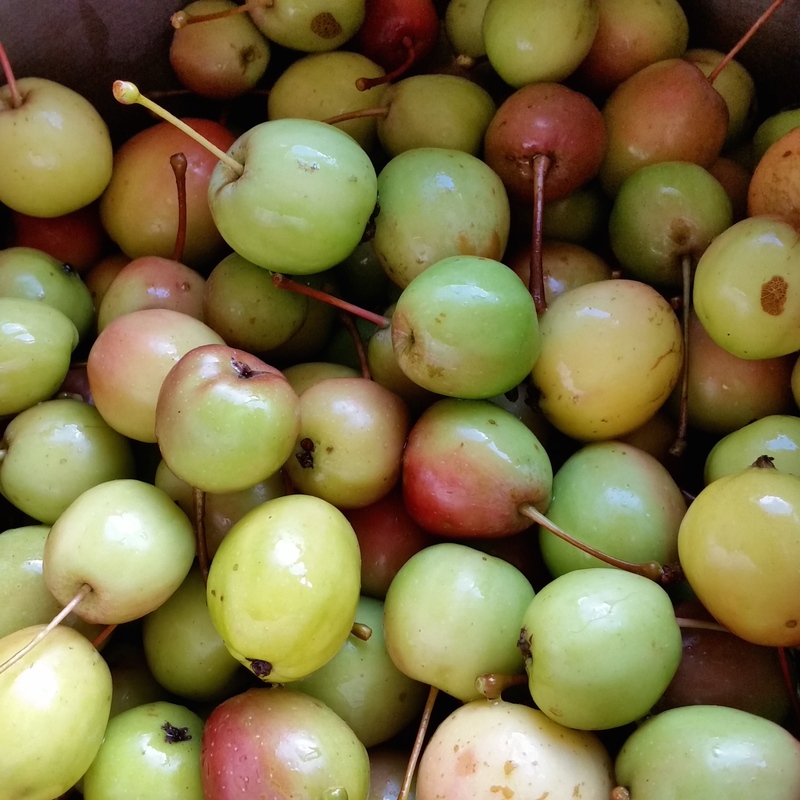 These crabapples are green with patches of red, but more often you will find the miniature apples are yellow or bright red. Whatever their colour, they all turn into the same magical colour when made into a jelly. Add enough water to just cover fruit and no more. At this point you can also decide whether to add some spices or to stay with the natural fruit flavour. 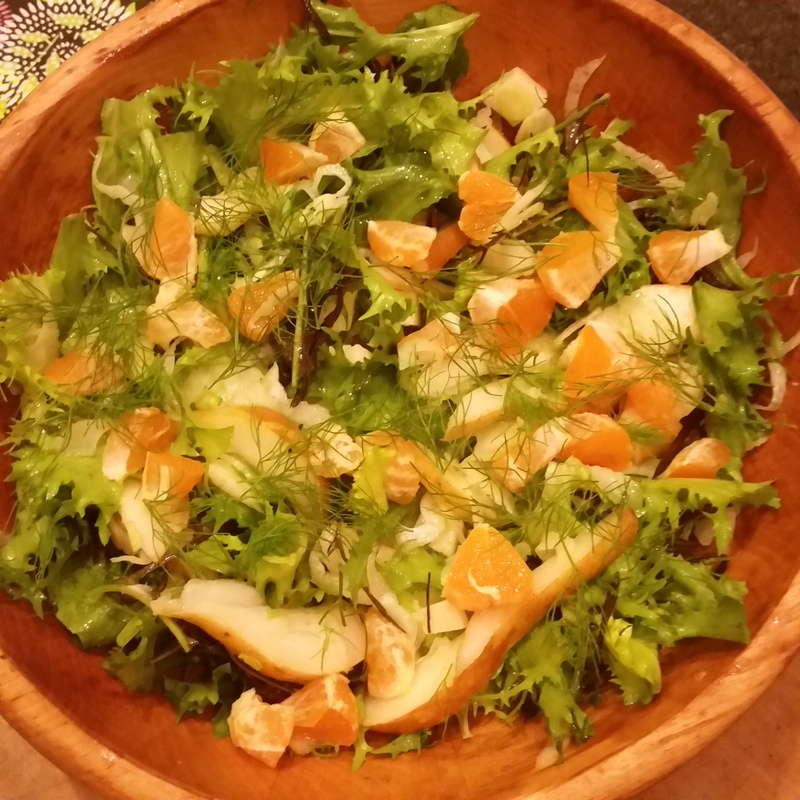 I have used cinnamon sticks, bay leaves, kaffir lime leaves, slices of ginger, citrus peel, cardamon, coriander seeds and star anise ...NOT all at once, of course. Choose what best goes with the type of fruit. I tend to use star anise or cardamon with strong flavoured fruit like plums; use ginger, kaffir lime leaves, and coriander to give a tropical touch and add flavour to subtle fruit like guava; cinnamon works well with apple. I would recommend working with the natural fruit flavour first and then think about an extra flavour dimension to the jelly when you make it a second time. If you need to add extra acidity to the brew this is the stage you add either a cut up lemon or lemon juice....more on acidity later. 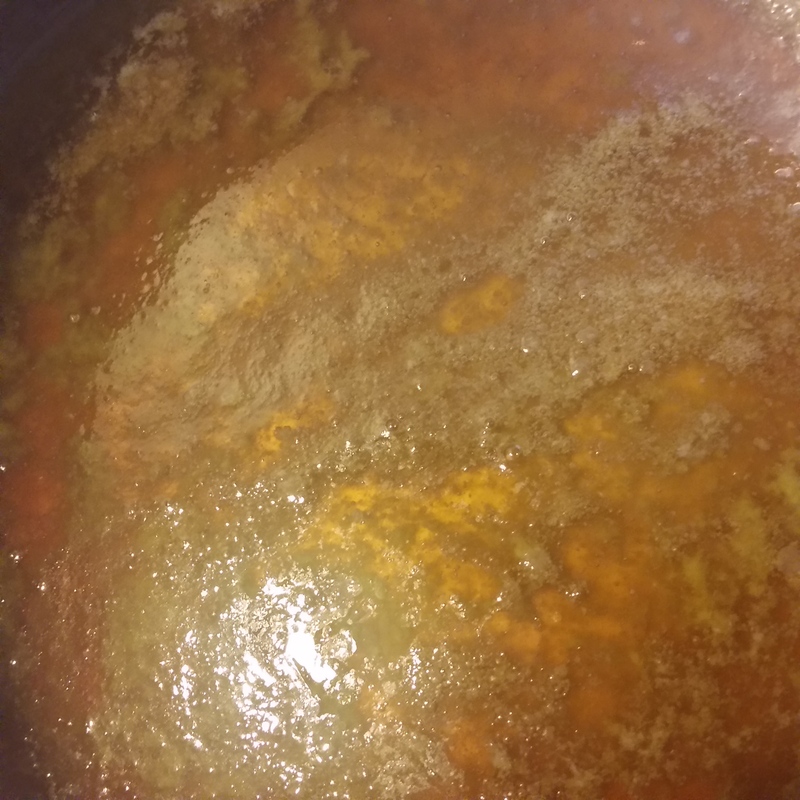 Simmer until fruit becomes soft and mushy and if still in large pieces use a potato masher to break down further. Tejocote or Mexican Hawthorn fruit cooked until mushy. Now it's time to strain the fruit pulp through a jelly bag. No need to buy or even sew a special bag - just a length of muslin or cheese cloth will do. I drape the material into a large bowl (a non-metal container) and gently pour in the pulp, gather up the cloth and slowly raise out of the bowl. 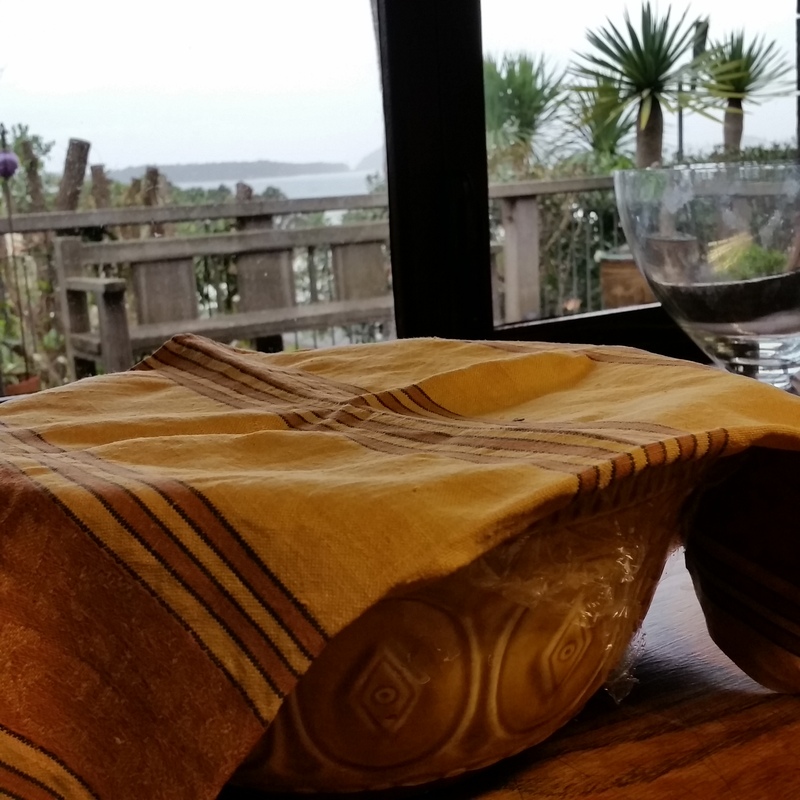 The bag has to suspend above the bowl and slowly drip over a day or night. Most important: do not be tempted to squeeze the jelly bag as this will make the jelly cloudy. The easiest way to suspend the bag is in between two chairs with a stick or broom handle. Tie the bag to the stick with string. To avoid small pokey fingers or a curious pet from interfering with the brew, I do this stage overnight. I don't waste the remaining pulp. 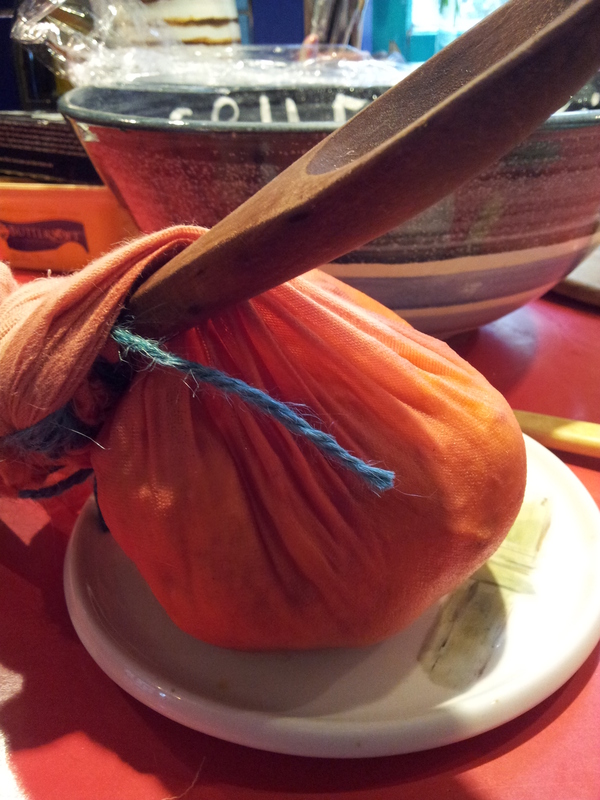 I tend to put it through a mouli and then use in smoothies or add to porridge. 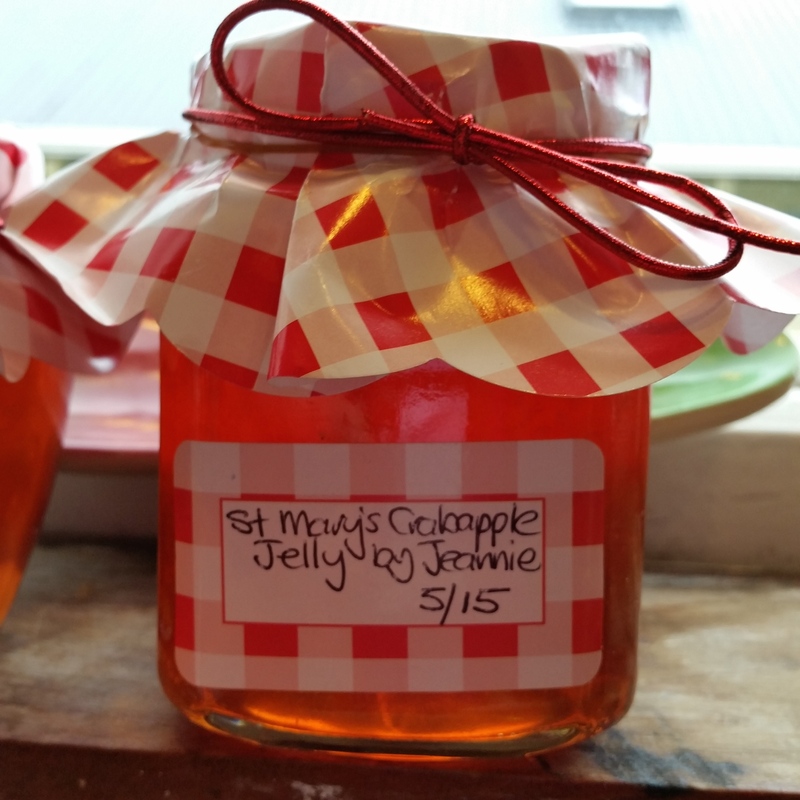 This jelly was a mix of hawthorn Crataegus and wild roadside apples from Kaweku in Southland and quince Cydonia oblonga from my sister's garden in Dunedin. I only had time to collect a few hawthorn berries so just made a small batch. 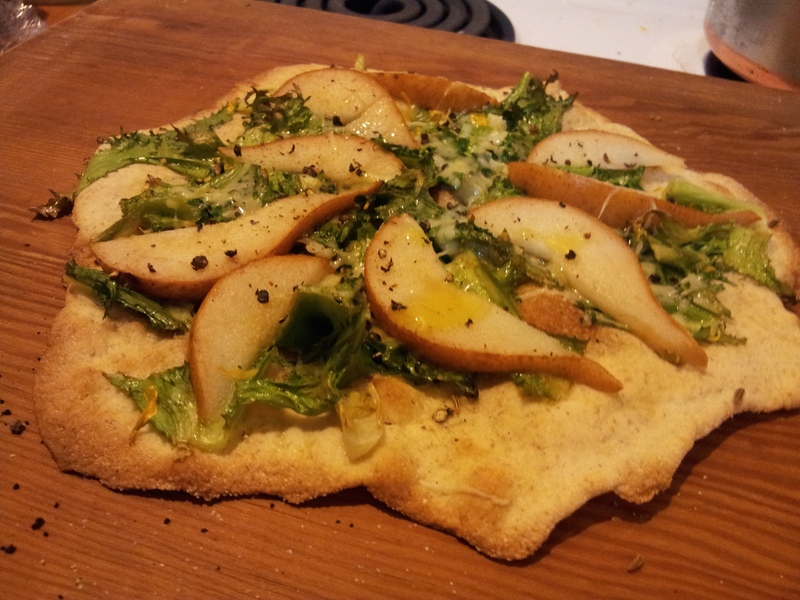 The added quince was important because the roadside apples weren't that flavourful. The quince would also improve the colour of the jelly. For a small quantity of fruit you can use a wooden spoon placed over a deep bowl. You may need to keep pouring off the liquid into a jug to ensure the liquid doesn't touch the bag. 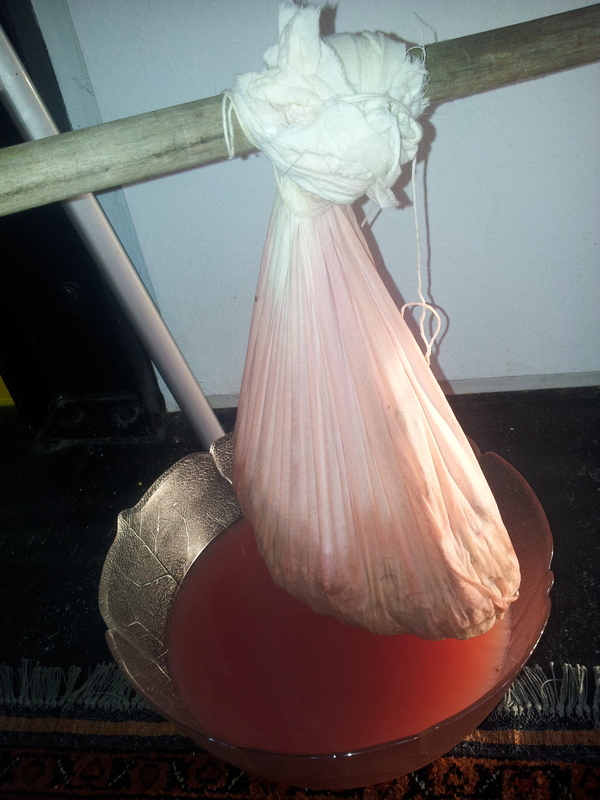 Crabapple juice from the jelly bag already indicating it's final ruby colour. 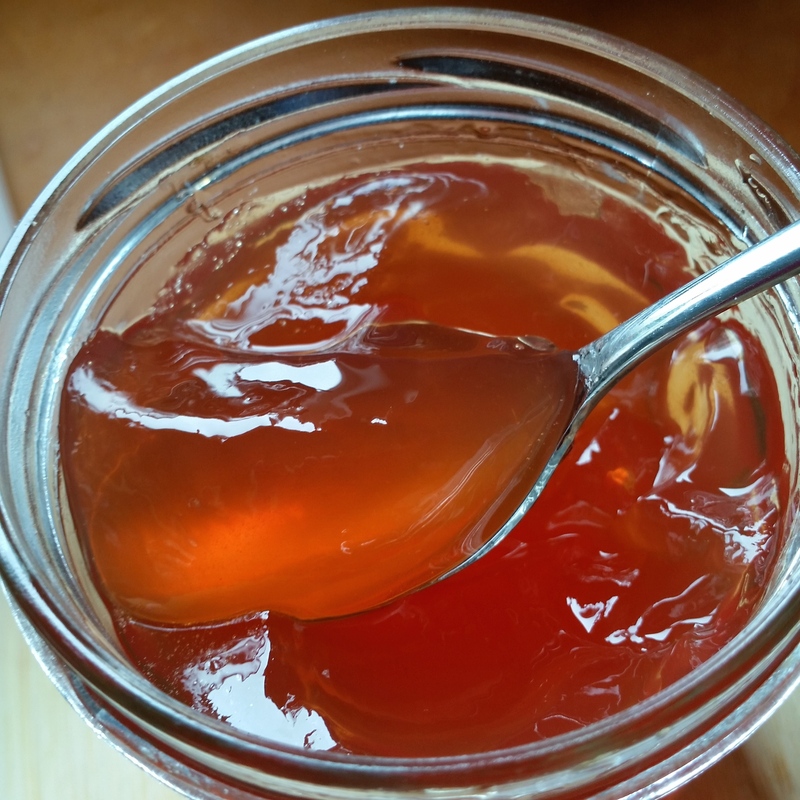 Quince jelly starts out a golden colour and then changes after cooking with sugar to a pinky red. Now I add the sugar. A lot of recipes state cup for cup of sugar and syrup. I find this makes it a little too sweet but it's a fine line - too little sugar and it won't set or keep well. So my standard is 3/4 cup of sugar to every cup of liquid. Sugar is the preserver in the jelly as harmful micro-organisms cannot survive in water that has 60% or more sugar content. Keep stirring until the sugar dissolves and once it has reached boiling point, stir every few minutes. The quince jelly is still a pale colour when beginning a rolling boil but it eventually transforms into the most exquisite coloured jelly. 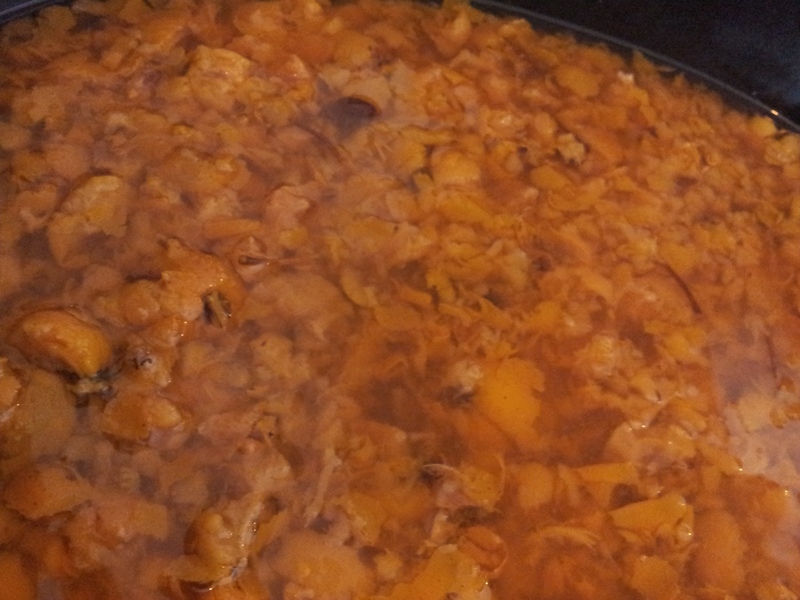 See my July 2013 posting "Make Cheese" says the Quince for the colour transformation and quince paste (dulce de membrillo). 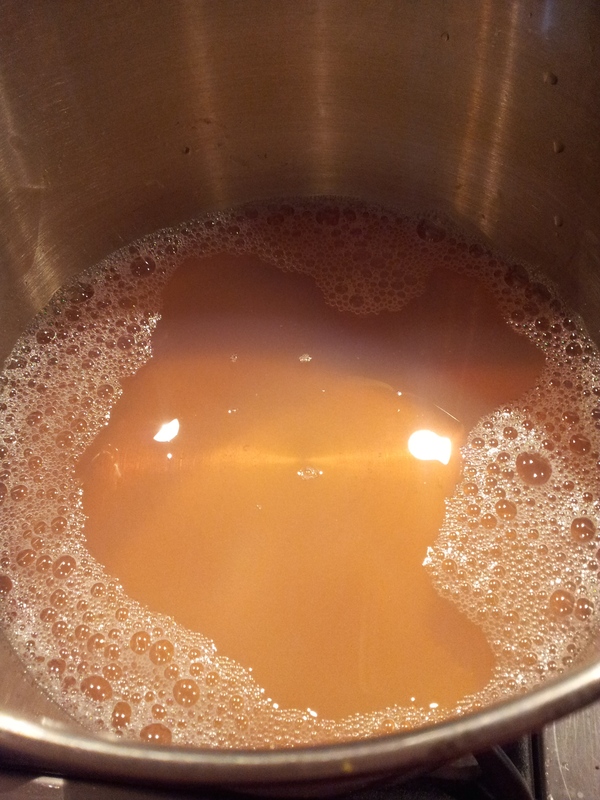 Deciding when it has boiled enough is the most tricky part of jelly making. It's actually better to underestimate than to over do the boiling. If it fails to set you can re-boil it ...but you need to add extra sugar as well. At the beginning of the process I place a couple of saucers in the freezer. If you put a little bit of jelly onto a very cold surface it will cool down quickly and indicate if setting point has been reached. Here grandson Beau is learning to check setting point by running his finger through the jam or jelly. If a clear track occurs then setting point has been reached. I also blow across the jelly surface and if it puckers up like a skin forming then it is likely it will set. Another indicator is the jam spoon that you use to stir the jelly. Is there a sign of setting jelly on the spoon? It has reached setting point, so I add a knob of butter to assist in dissolving the foam. Some scoop this foam off with a saucer, but I think too much jelly is lost doing that. 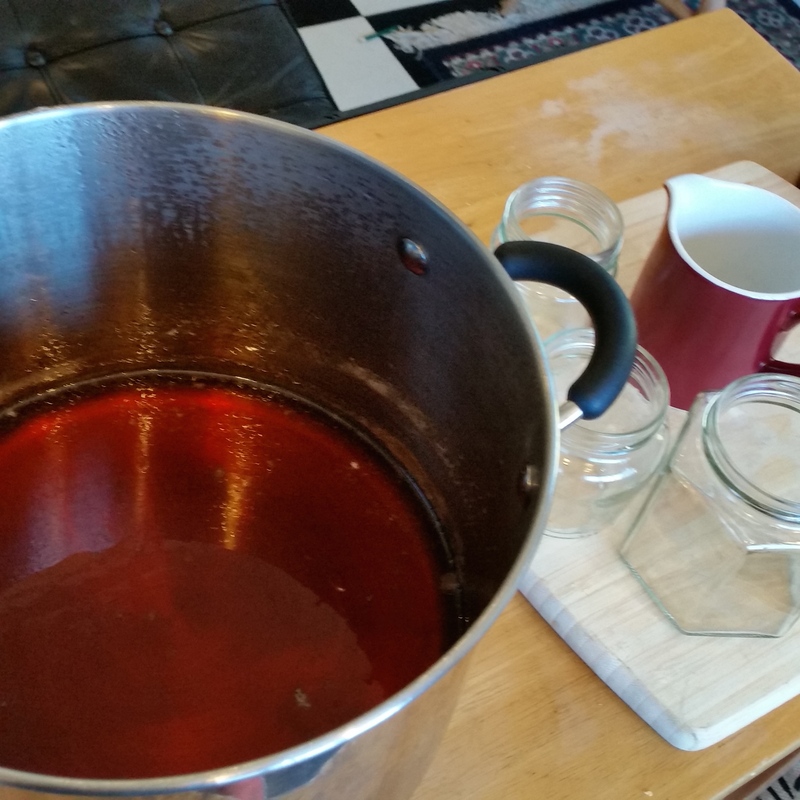 I carefully place the hot jam onto a wooden board , with jars and a jug that has been pre-warmed. The jelly jars have been washed and placed into an oven at around 150 degrees Celsius for at least half an hour to sterilise them. It's important also to have the jars hot when adding the very hot liquid jelly to avoid the jars cracking. I tend to use recycled jars with screw top lids. These lids are sterilised in boiling water for 10 minutes. A perfect crabapple lightly set jelly. "The rest of Europe makes jam that slides sexily off the mound of clotted cream and dribbles down the edge of the scone (an exquisite moment if ever there was one). ..We make jam a little bit like ourselves. A jam that is a bit uptight and reserved, a preserve that wobbles tautly rather than falls off the spoon with a slow, passionate sigh." I have also had the odd jelly that has refused to set. To avoid this happening again I've had to understand the chemistry involved in creating a jelly. Three elements have to work together - pectin, acid and sugar. Sugar separates the water and pectin molecules. Pectin molecules are the gel of the jelly but alone are negatively charged so they won't work together until positively charged acid comes along. Cooking apples, crabapples, currants, gooseberries, japonicas, sour cherries, citrus, and sour plums like Damson are all fruits high in pectin and acidity. Jellies or jams made from these fruits will set quickly and you can use a lower ratio of sugar with these fruits...but because of the tartness of these fruits, you need to make your sugar proportion decision on taste as well. Quince jelly is loved for its jewel-like quality and is an excellent provider of pectin. But it's low in acidity so to ensure quince jelly sets add extra acid in form of lemon juice or add a couple of sour cooking apples to your quinces when boiling up the cut up fruit. Apricots, strawberries, raspberries, rhubarb, sweet cherries, pears, medlars and elderberries are lower in pectin and acidity, so these fruits need help. Either you have to marry them with one of the high pectin fruits e.g. gooseberry with rhubarb, redcurrant with strawberry/raspberry, apple with elderberries. Or you can buy jam making sugar that has added pectin and acid. Never use jam making sugar for fruits high in pectin and acid....unless you want the sort of jelly that won't fall out of the jar when upended. These low pectin and low acid fruits on their own need a higher ratio of sugar. My classmate Sinead helped me to pick Barberries...carefully. 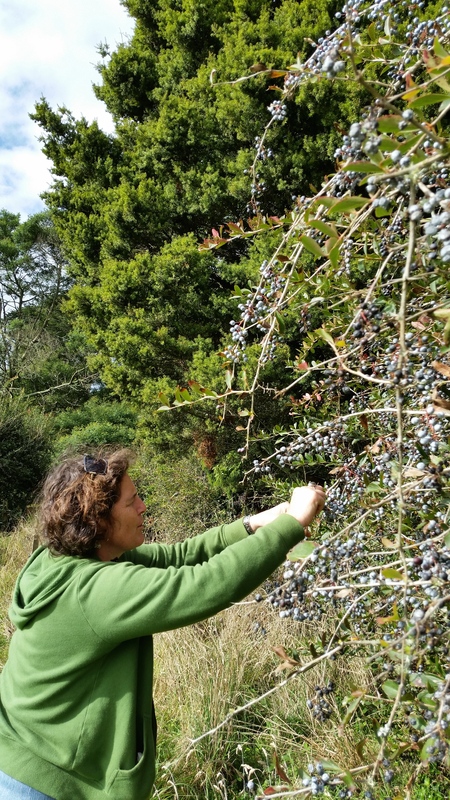 In April I foraged barberries while on a field trip to Chaos Springs on the beautiful Coromandel Peninsula. 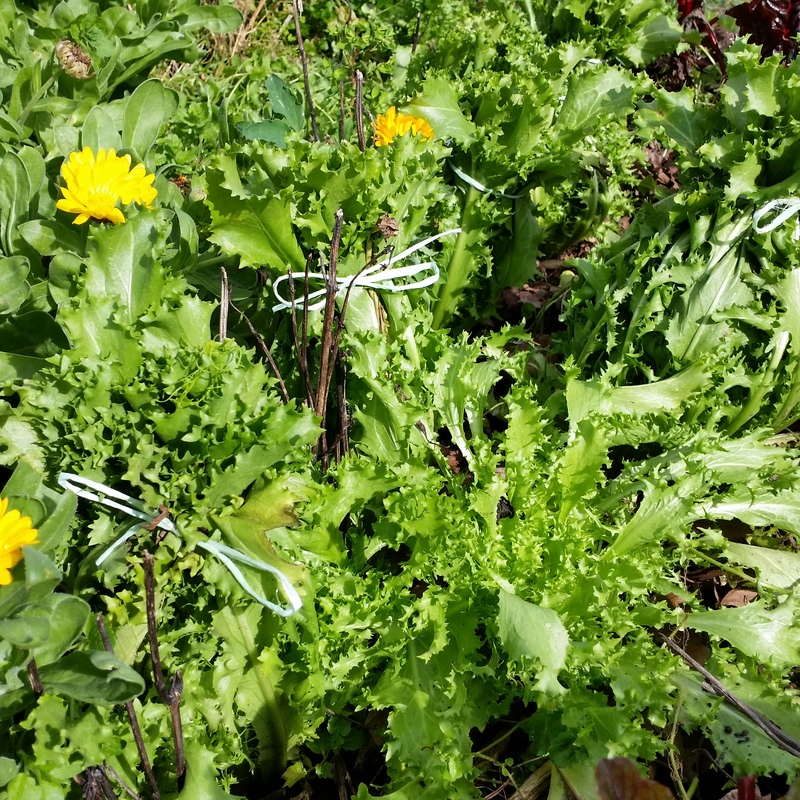 While admiring the long windrows of organic compost with our organic horticulture class, I spied a hedgerow in the background covered in fruit. I asked Steve, the owner, what were these trees? He replied the hedgerows were established long before he took over the farm and said they were barberries Berberis. I Googled (as you do) and discovered barberries have good nutritional benefits and can be used for making jelly. Steve was happy for me to harvest, warning me that they have vicious thorns. I was a little uncertain about the amount of pectin in barberries so used the last of the quinces stored in the fridge. Once fruit gets really ripe the amount of pectin reduces, and as both the quince and the barberries were quite ripe, my jelly while tasting delicious didn't really set. Barberry and Quince Jelly is showing signs of low acid content with sugar crystals appearing just after 4 months. Another sign of a not so perfect jelly showed up four months after it was made. The sugar in the jelly started to crystallise which is a telltale sign that there was not enough acid in the jelly. I have since learnt from reading Pam Corbin that you can do a quick check to see if your fruit has enough pectin. Cook up some of the fruit and add 1 teaspoon of the cooked fruit juice to 1 Tbsp of whisky, gin or meths. Shake gently and leave for a minute or two. 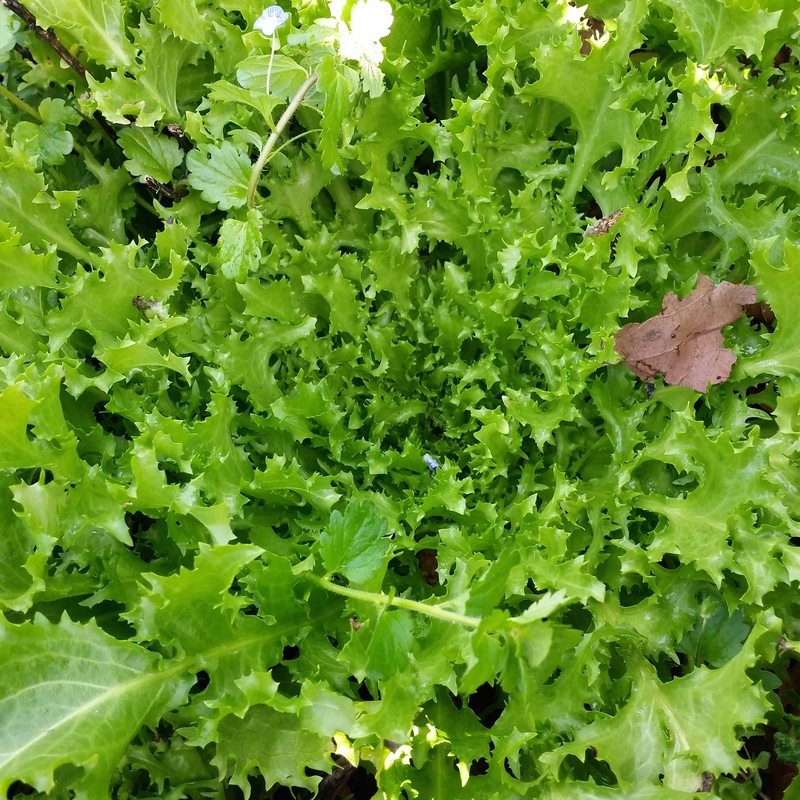 If the juice forms a firm clot it is high in pectin, if it forms several small clots it has medium pectin and if the juice remains fairly liquid then its low pectin. Making jelly from frozen fruit also reduces the available pectin. So what jelly am I planning on making next year? 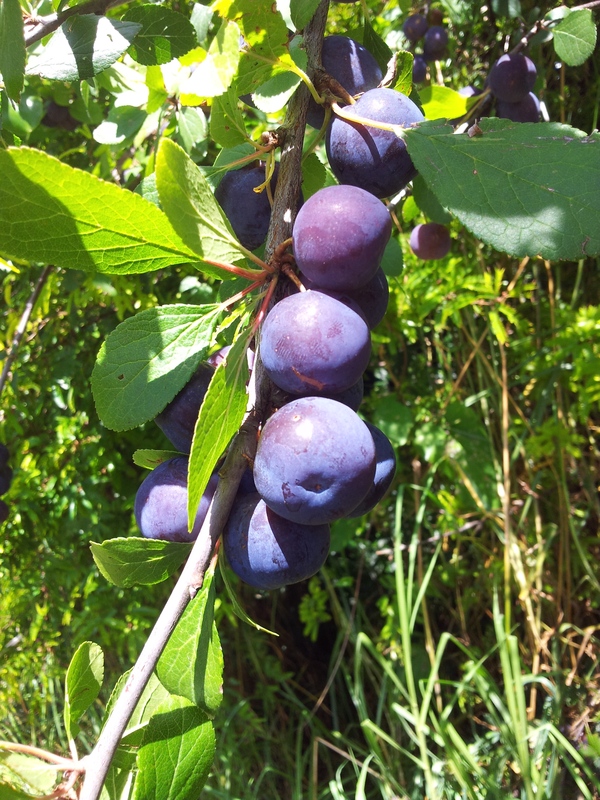 Damson plum Prunus domesticus is a small sour plum with a blue blush - you have to try and beat the birds because they love them. In February I had access to some damsons that I made into damson paste but next year I'm planning on making some damson jelly. The colour and rich flavour should make a stunning jelly and its a fruit that is high in both pectin and acid so the chemistry should be right for a perfect set.